Hello there – time for a little springtime update! My main focus during the couple of months since my last post has been working towards the exhibition at Ainscough Contemporary Art gallery (www.acag.co.uk). This was a very important event for me as it was all about showcasing my new ceramics and 2d work that I’ve been doing since the funding period started 8 months ago. It was a very good opportunity to see what people were going to think of the new direction my work has been taking, as there are two Ainscough galleries, one in Chelsea and one in Dartmouth – so this was a good way of reaching people over a large area. Plus, I have had a long and very happy relationship with this gallery, which was a big factor in me asking to have the show with them. I did a proper pr campaign about this show with Mel Harris, who very kindly agreed to help me with this for the arts council funded activity plan. 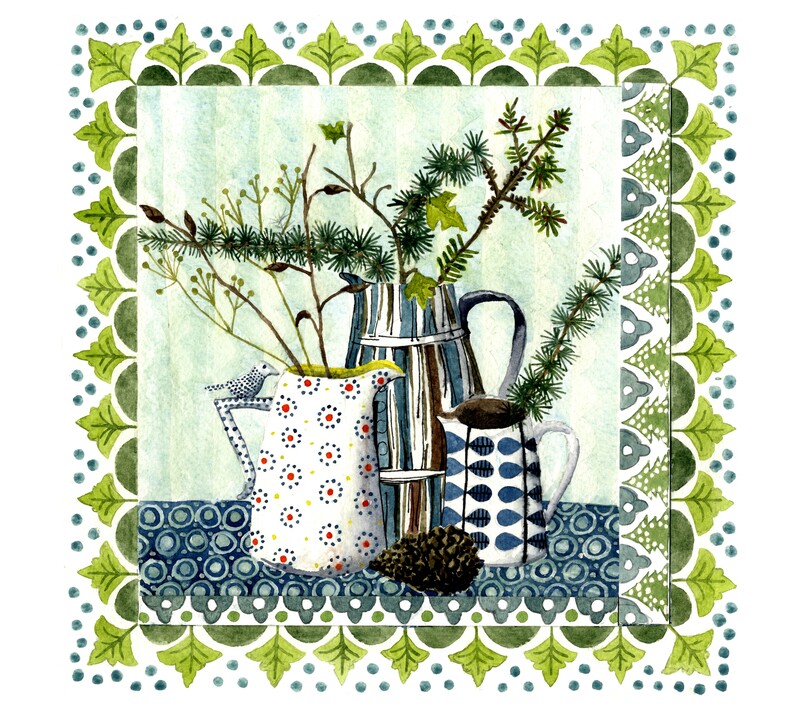 We sent a press release and images out to about 50 selected magazines, newspapers and blogs, and I was so delighted with the results as it got picked up by about 10% of them, including the Sunday Times magazine and the fabulous print and pattern blog (www.printpatternblogspot.com). 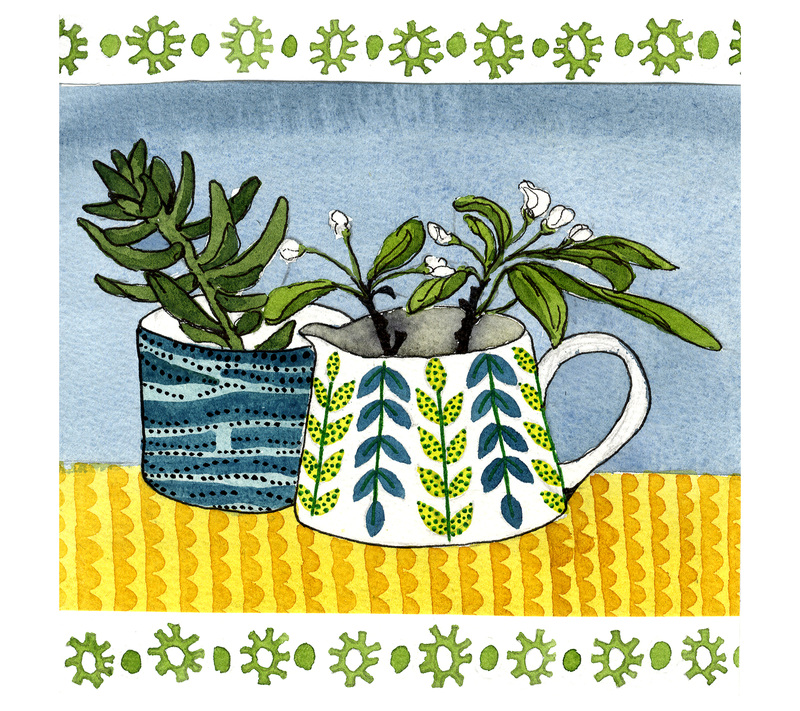 I had about 60 pieces of ceramics, five original watercolours and two lino cuts (plus a collage of the two lino cuts mashed up together with some watercolour painting and pencil drawing on it, which I really enjoyed doing and plan to do more of some time!). There were also 25 hand bound books that were the results of the collaboration between myself and Heather Dewick, a fantastic bookbinder from Sheffield. I’ll put some photos of these on a page here. I drove everything down to the gallery in Chelsea, as I couldn’t trust a courier with all of the new work – it was basically everything I’d made since the funding period started, so it was extremely precious! I had a great time driving through London with my pots – I have never done this before, and it was so interesting to see how quickly the view changes between the end of the M1 and the middle of lovely leafy Chelsea – something I completely miss on the Tube. 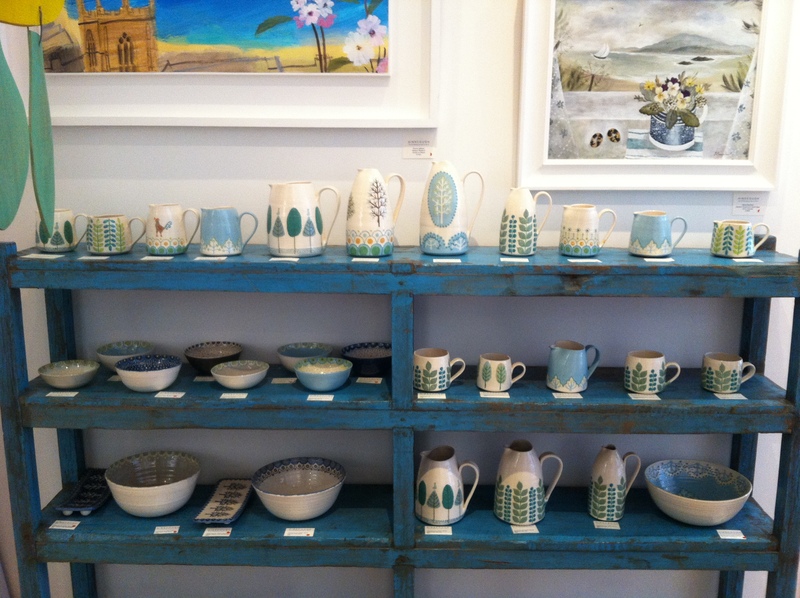 I was feeling quite nervous about the reception my new work would get, imagining that people were going to be disappointed not to see much tableware (which is what I have been making since I started my ceramics practice in 2005). So I was very glad that my mum came up on the train to meet me on the afternoon of the private view! 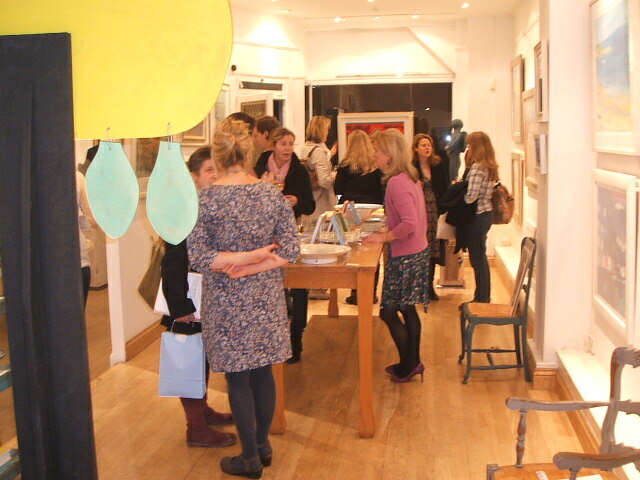 But I needn’t have worried, as the private view was great and lots of pieces were sold. Now the exhibition has moved to Dartmouth, and nearly everything has been sold, and I have quite a few commissions to make for people that wanted items that had been sold. So it couldn’t have gone better really, and I feel very happy that my new work has had such a positive response. 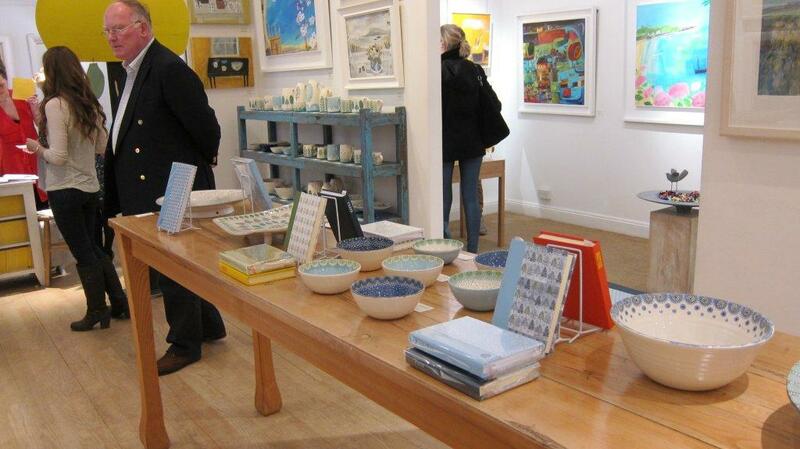 Here are some images of gallery in Chelsea, and the private view. That’s me in the flowery dress, talking to Linda Bloomfield, who makes beautiful porcelain tableware (www.lindabloomfield.co.uk) – I was very glad that she came as I was feeling rather like a lemon at this point; I never know what to say to people at these things! 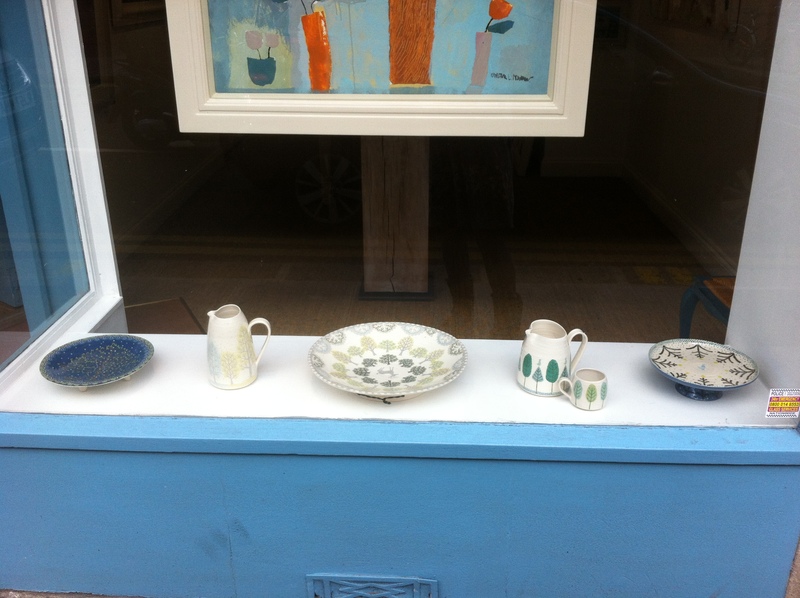 One of the front windows of the gallery, from the outside.. 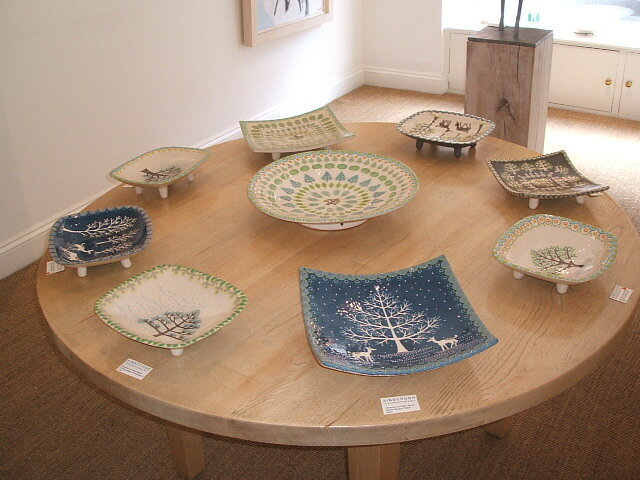 Some of the books I designed and Heather Dewick made, together with some tree bowls. 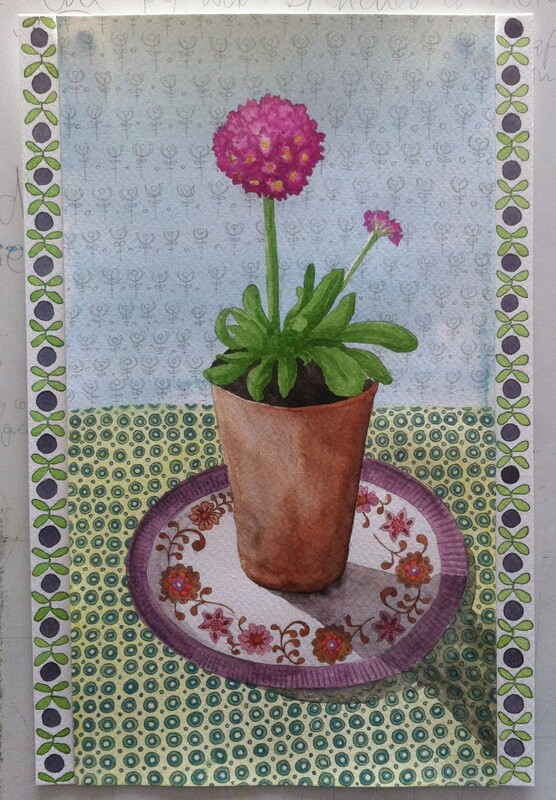 I had a call from Potterton Books (www.pottertonbookslondon.com) just before Easter about my watercolours. 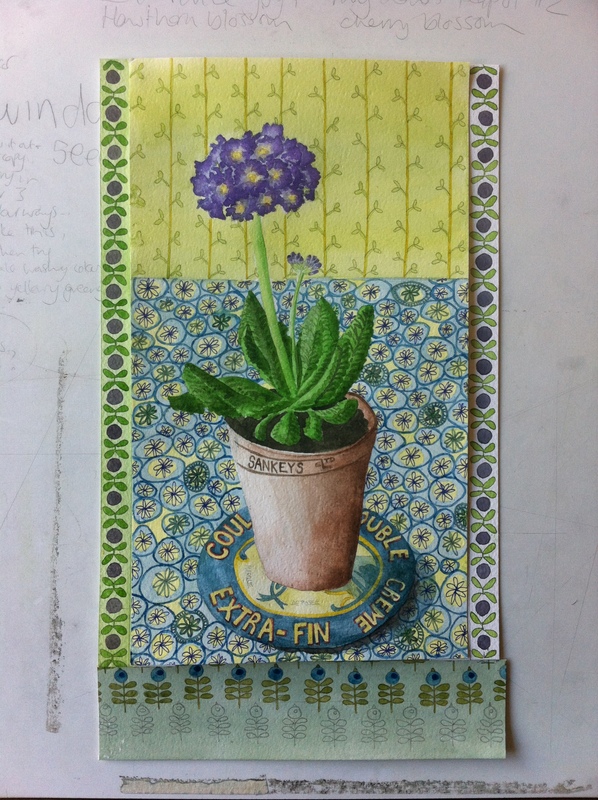 They had seen my work at Ainscough Contemporary Art, and invited me to send them a collection of watercolours for a display to coincide with the Chelsea Flower Show in May. I was very pleased about this, as they have work by some of my favourite artists and printmakers in there – Mark Hearld, Emily Sutton, Angela Harding and Ed Kluz…so I feel quite honoured to have my work with them! So this is what I have been doing during the Easter holidays, while the boys were home. 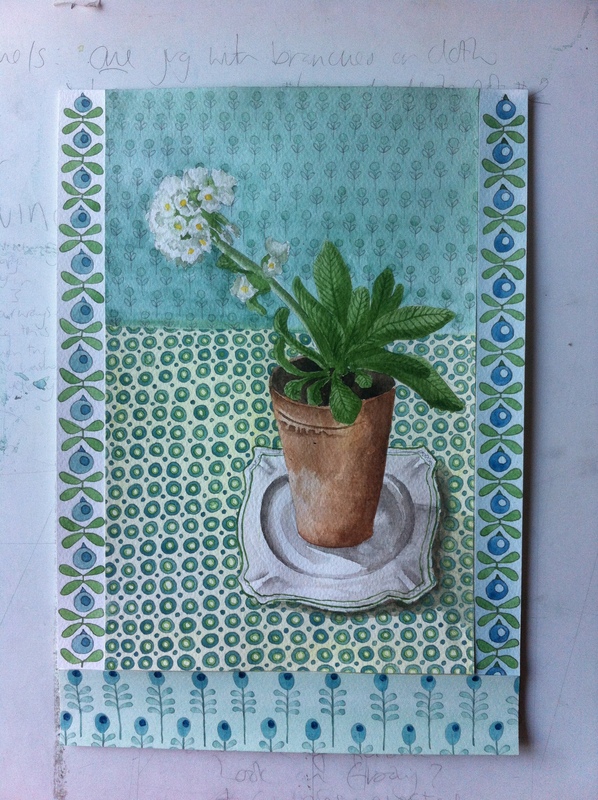 I did a set of three paintings of primulas in pots on plates that I really like – doing these paintings has helped me to identify what is working and what needs to be ironed out with my compositions etc…I really love the theme that is developing of putting handmade or patterned (vintage or contemporary) manufactured ceramics together with various pieces of patterned fabric I’ve collected and including plants or foliage/flowers with them (as leaves and branches etc are very much what inspires my pattern designs), and I’m very much enjoying playing around with different borders. But the thing that always stumps me a bit is the background and the overall positioning of everything – as I have the pieces on the fabric in front of me, but the background is just a random view of my living room beyond the kitchen table (where I sit while I am painting), so I have to make that bit up, and this is where it all goes a bit woolly, and the endless possibilities of this sudden trip into the realms of imagination leaves me a bit floundery. So when I have hit upon a good solution for this I will be very happy…anyway, here are some of the paintings I did for Potterton Books (a bit scrappily photographed on my drawing board unfortunately! ): This is a plate I bought in my local Oxfam shop as part of a lovely tea set. The back says ‘Barratts of Staffordshire’ and the pattern is ‘Lilac Fayre’. I bought this beautiful little square plate from my friend Teresa Green’s new shop and cafe in Exeter (www.belgreen.co.uk), which she has recently opened with her friend and chef Isabel Davies. We stayed with Teresa for the Easter weekend, and had brunch at Belgreen on Easter Monday. I can totally thoroughly recommend it to anyone who might be passing nearby! Teresa has been scouring antiques markets, car boot sales etc, and has collected a gorgeous array of vintage kitchenalia for the shop. And Isabel makes the kedgeree I have ever eaten. That is one of those tiny little camembert plates that come in sets of four. I’ve only got three though, after an unfortunate washing up incident. See what I mean about those backgrounds? 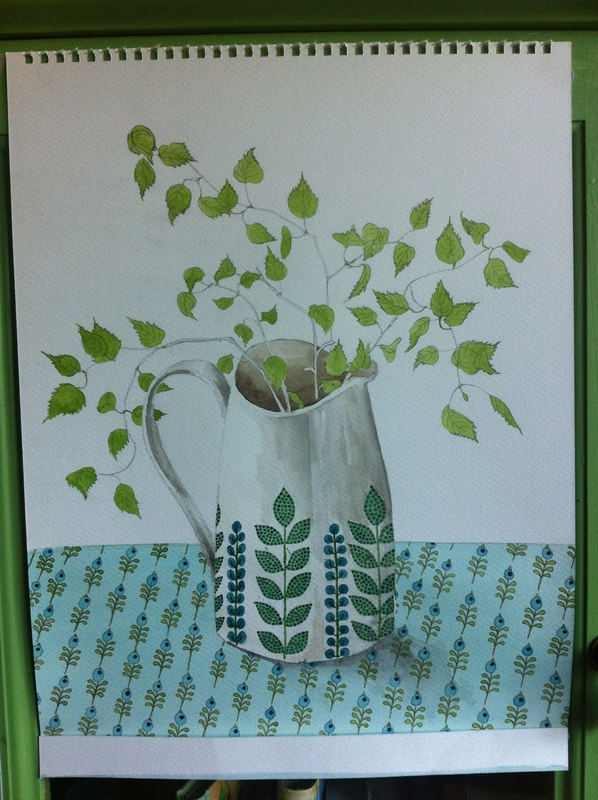 I am nearly finished with another one, which is of bright green brand new birch leaves from a tree in my garden, in a large Melanie pattern jug. 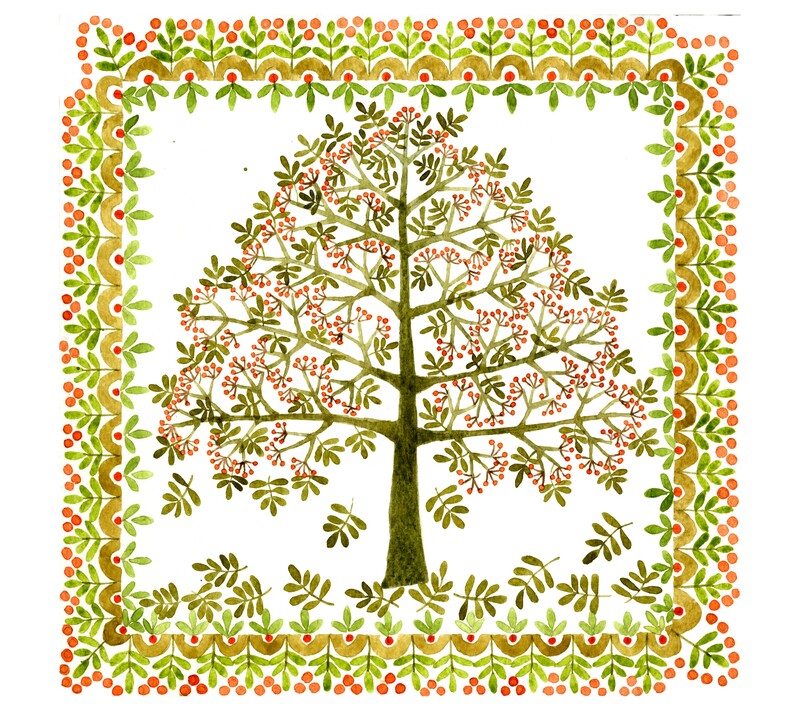 I just have to finish the detail on the branches and leaves… and maybe put a border around it (maybe not though, I quite like it with the space around it at the moment) So I’ll finish this one and then I had better get on with making some pots for my next big event…which is the contemporary craft fair at Bovey Tracey on 15-17 June (www.craftsatboveytracey.co.uk) – which is always fantastic and a highlight of my calendar! I also have to make some platters for the Bowie gallery in Hay on Wye (www.hayclay.co.uk), who will have them on their stand at the Hay Festival in May.